This is a floating window showing all files and dependencies of the project. Open the selected file or package. Add a file or dependency. Remove a file or dependency. Note that some items only appear when right clicking on a file or dependency. Check this to disable the automatic update of the .po file for the strings of the lfm of the unit. For the general options see project options. Open the package editor of this dependency. Change order of dependencies. The order is used by the IDE, but you should not rely on it. This feature exists mostly for aesthetic reasons. Same as above, but one position down. Store the relative filename to the .lpk file in the project (.lpi) file to use as default. 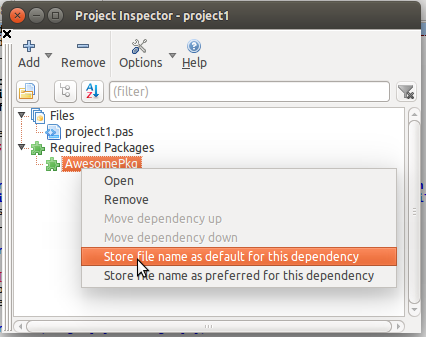 When the project is copied to another computer and the project is opened, the IDE searches for all needed packages. As last default it uses this filename. Store the relative filename to the .lpk file in the project (.lpi) file to use as preferred. When the project is opened the IDE opens the given package file. If a package with the same name was already open, it will be replaced by the preferred one. This function exists since 0.9.29. Clears the default filename for this dependency set by the above 'Store dependency filename'. Remove all files from the project that do not exist in the file system. This function exists since 0.9.29. This page was last modified on 2 April 2017, at 08:42.